"Do not forget that ‘skill and integrity' are the keys to success." This was the last piece of advice on a list Will Thurmond gave his son Strom in 1923. The younger Thurmond would keep the words in mind throughout his long and colorful career as one of the South's last race-baiting demagogues and as a national power broker who, along with Barry Goldwater and Ronald Reagan, was a major figure in modern conservative politics. But as the historian Joseph Crespino demonstrates in Strom Thurmond's America, the late South Carolina senator followed only part of his father's counsel. Political skill was the key to Thurmond's many successes; a consummate opportunist, he had less use for integrity. He was a thoroughgoing racist—he is best remembered today for his twenty-four-hour filibuster in opposition to the Civil Rights Act of 1957—but he fathered an illegitimate black daughter whose existence he did not publicly acknowledge during his lifetime. A onetime Democrat and labor supporter in the senate, he switched parties in 1964 and helped to dismantle New Deal protections for working Americans. If Thurmond was a great hypocrite, though, he was also an innovator who saw the future of conservative politics before just about anyone else. As early as the 1950s, he began to forge alliances with Christian Right activists, and he eagerly took up the causes of big business, military spending, and anticommunism. Crespino's adroit, lucid portrait reveals that Thurmond was, in fact, both a segregationist and a Sunbelt conservative. The implications of this insight are vast. Thurmond was not a curiosity from a bygone era, but rather one of the first conservative Republicans we would recognize as such today. 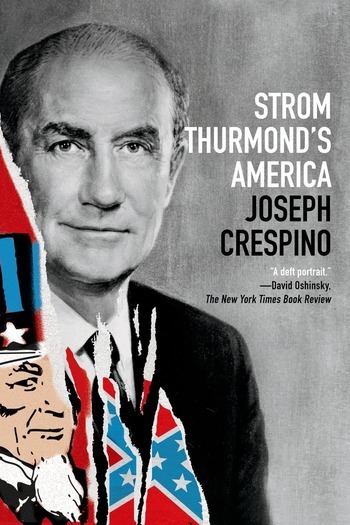 Strom Thurmond's America is about how he made his brand of politics central to American life. Joseph Crespino is a professor of history at Emory University. He is the author of In Search of Another Country: Mississippi and the Conservative Counterrevolution and the coeditor of The Myth of Southern Exceptionalism. He lives in Atlanta, Georgia.